When you think of the Bay Area, you don’t expect a thriving roots music scene. Yes, we know Hardly Strictly Bluegrass happens annually, and really – a San Francisco bluegrass scene? get outta here, right? The bay is known for churning out rock and roll legends, hippie dreams, iconic punk bands and metalheads, and rappers like Too Short and G Eazy. Roots music, not so much. When you get past the initial shock of it all, there are a handful of super cool bands putting in the work and gigging throughout Berkley, San Francisco and Oakland. There are fiddles and washboards, murder ballads and downright good music planting the flag for Northern California and it’s fantastic. One of the better bands coming out of the bay is Three Times Bad, a music collective more than a fully formed group in 2018, but rips nonetheless. As lineup changes have put Three Times Bad on hold, a side project has sprung up featuring the funky duo of Raheemah Nitoto and Sam Caine, respectively known as Critters. Critters is a simple call, and response take to an older style of folksy Americana ala Devil Makes Three and early Shovels and Rope. Critters are just getting their legs and have only released a few videos via their page, but they’re worth keeping an eye and ear for. At their core, the selection of songs Critters has released so far seem like tunes that reflect a night out at the bar, drinking tallboys and stomping away as folks holler along. Because of their stripped down, bluesy nature, Critters tunes are easily digestible and don’t ask for much more than a good time. It’ll be fun to keep an eye on the duo since it’s just the two of them and that cuts the red tape way down and sends the output way up. 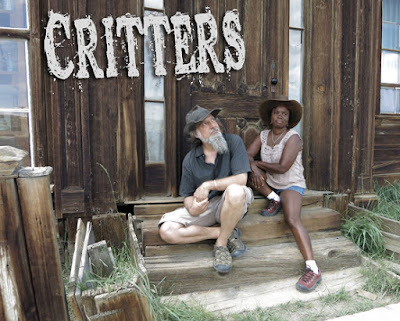 Keep your eyes on Critters y’all, they’ve got the DNA to be a damn fine soundtrack for a night out at the local pub, in California, Chicago or even eastern Kentucky.